210 pages | 3 B/W Illus. This book develops an analysis of the historical, political and legal contexts behind current demands by NGOs and the United Nations Human Rights Council to hold corporations accountable for their human rights violations. Based on an analysis of the range of mechanisms of accountability that currently exist, it argues that that those demands are a response to the failure of neo-liberal policies that have dominated the practice of politics and law since the emergence of this debate in its current form in the 1970s. Offering a new approach to understanding how struggles for hegemony are refracted through a range of legal challenges to corporate human rights violations, the book offers a fresh perspective for understanding how those struggles are played out in the global sphere. 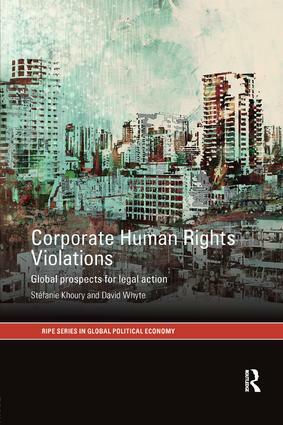 In order to analyse the prospects for using human rights law to challenge the right of corporations to author human rights violations, the book explores the development of a range of political initiatives in the UN, the uses of tort law in domestic courts, and the uses of human rights law at the European Court of Human Rights and at the Inter-American Court of Human Rights. This book will be essential reading for all those interested in how international institutions and NGOs are both shaping and being shaped by global struggles against corporate power. The Global Compact: ‘Support Group’ or ‘Good Old Boys Club’? The "Continuation of a Business-Friendly Agenda"? Conclusion: New Mechanisms of Accountability for Corporate Human Rights Violations? Stéfanie Khoury is Research Associate the University of Liverpool, UK. Her research focuses on the lack of accountability of state and corporate violations of human rights. David Whyte is Professor in Socio-legal Studies at the University of Liverpool, UK, where he specialises in teaching and researching the relationship between corporate power and law.